Canopy will be opened and closed completely manually, which will save 10 kg on actuators. Aerodynamics will be optimized for maneuverability; check the previous version of the article for details since there won’t be many changes. Engine will be a single-engine modification of F414-EPE, providing 16.800 lb (74,7 kN, 7.620 kgf) dry thrust and 26.600 lb (117,4 kN, 11.975 kgf) wet thrust along with excellent foreign object damage resistance; it will also improve endurance when compared to the EJ-230. Dry weight will be 1.110 kg. Unlike previous proposals, gun will be French GIAT-30. While its higher rate of fire means greater ammo expenditure compared to the BK-27, and higher caliber means less rounds carried, greater energy of individual projectiles and better acceleration mean that it is more effective at getting kills during short opportunities in an actual dogfight. Gripen E has an empty weight of 7.100 kg and likely unit flyaway cost between 50 and 60 million USD in 2014 dollars. Radar likely costs around 3 million USD (comparing with other AESA radars), giving cost of 47 to 57 million USD without it, and average of 7.324 USD per kg. Operating cost is expected to be around 5.000 USD per hour of flight, though comparing with Gripen C, 5.700 USD per flight hour is possible. 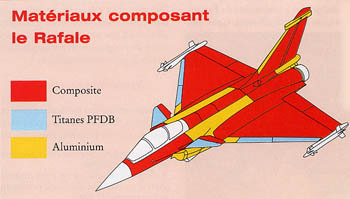 Its range of 250 km will allow it to be used against radar-using fighters before they become aware of the FLX’s presence, as well as against AWACS, and unlike all modern BVR missiles, it will be effective against fighters across its entire range envelope, although large primary stage miss margins might reduce that effectiveness at longer ranges – secondary stage WVR missile will have to maneuver not only to counter target’s movement (including possible evasive maneuvers) but also to compensate for errors in first-stage maneuvering and errors in launch platform’s targeting. Interferometric RWRs have accuracy of 1* or less, while legacy RWRs have accuracy of 15*. As Elbit Systems EW suite used does have geolocation capabilties, it will allow FLX to engage enemy fighters at beyond their own engagement, or even detection, range. This missile will replace MICA IR in FLX’s loadout, and will provide for same loadout options. Its higher weight however means that FLXs BVR combat weight (50% fuel, 2 WVR AAM, 4 BVR AAM) will be 5.744 kg, for a wing loading of 274 kg/m2 and thrust-to-weight ratio of 2,08 in afterburner or 1,33 in dry thrust. Wing loading and TWR for dogfighting weight will stay the same since BVR missiles will have been fired by the time of the merge. Surprise often dictates who wins and who looses the fight. To maximize the possibility of success, surprise must be total. This means that opponent must be completely unaware that he is about to be attacked; as a consequence, active sensors will have to be kept shut down. Further, it is not enough to detect the aircraft, it musta also be identified. This is also only done reliably with visual sensors, such as IRST. As a consequence, achieving surprise requires high cruise speed, fully passive situational awareness, as well as low visual and IR signatures. FLX can be expected to cruise faster than any other fighter in the service with possible exception of the F-22. But the F-22, with its lack of IR sensors and large physical size, will be very easy to detect. In short, FLX allows for three times as many sorties per day as the next best aircraft, while remaining individually superior to all fighters listed. Due to low wing loading and high thrust-to-weight ratio combined with close-coupled canards, FLX will enjoy advantage in both instantaneous and sustained turn rates when compared to any fighter aircraft currently in service. Presence of close-coupled canards will, when combined with small size and lightly loaded delta wing, also result in unmatched transient performance, allowing FLXs pilot to easily break enemy pilot’s OODA loop. FLX will be capable of accelerating to the supersonic speed while going straight up, and without using afterburner. Here, FLX has a two-fold advantage: first, it has very high fuel fraction of over 40%. Second, its high thrust-to-weight ratio means that pilot does not have to use afterburner at all; it would actually be possible, maybe even desireable, to remove F-414s afterburning capability in order to reduce weight and complexity. This will allow FLX to use up fuel at several times slower rate than its opponent while still outmaneuvering him. As for range, Gripen E has unrefuelled range of 2.500 km on internal fuel; significantly smaller FLX can be expected to have range of over 3.000 km on internal fuel. As noted before, achieving reliable kills is dependant on surprise. As such, FLX will have advantage over all modern fighters due to its passive combat capabilities and small visual and IR signatures. Usage of high-calibre revolver cannon will also mean better ability to achieve gun kills when compared to US fighters using rotary cannons, while usage of IR BVR missiles will improve ability to achieve BVR kills due to better ability to achieve surprise, greater reliability of missiles and reduced vulnerability to countermeasures. This scenario will approximate performance in combat of Western aircraft listed against Chinese Flankers; scenario itself is taken from a 2008 RAND study, and will involve cost-equal number of aircraft without regard for their sortie rates. Baseline number will be 76 Su-30MKKs that PLAAF has; at 73.39 million USD each, total cost is 5,58 billion USD. Blue fighters cannot run since doing so would result in tankers being shot down and them being forced to land on Taiwan, whose bases have been destroyed in opening missile barrage; Red fighters can only run if faced by non-supercruising F-35A or JAS-39C, but will not do so until casualties reach 80%. Pk per salvo will be assumed to be 0,19 for a 2-missile salvo, 0,271 for a 3-missile salvo and 0,34 for a 4-missile salvo with BVR missiles plus 0,15 per WVR missile, whereas gun fight will be assumed to result in 1 for 1 exchange ratio. 76 Su-30s engage 20 F-22s. 20 F-22s fire 40 3-missile BVR salvos. 11 Su-30s lost. 65 Su-30s fire 130 3-missile BVR salvos. 20 F-22s lost. 65 Su-30s remaining. Red Force victory. 76 Su-30s engage 29 F-35As. 29 F-35s fire 29 4-missile BVR salvos. 10 Su-30s lost. 66 Su-30s fire 132 3-missile BVR salvos. 29 F-35s lost. 66 Su-30s remaining. Red Force victory. 76 Su-30s engage 118 JAS-39Cs. 76 Su-30s fire 152 3-missile BVR salvos. 41 JAS-39Cs lost. 77 JAS-39Cs fire 77 4-missile BVR salvos. 26 Su-30s lost. 50 Su-30s fire 200 WVR missiles. 30 JAS-39Cs lost. 47 JAS-39Cs fire 94 WVR missiles. 14 Su-30s lost. 15 Su-30s engage 47 JAS-39Cs in gun fight. 15 Su-30s and 15 JAS-39Cs lost. 32 JAS-39Cs remaining. Blue Force victory. 76 Su-30s engage 58 Rafale Cs. 76 Su-30s fire 152 3-missile BVR salvos. 41 Rafale Cs lost. 17 Rafale Cs fire 34 3-missile BVR salvos. 9 Su-30s lost. 67 Su-30s fire 268 WVR missiles. 40 Rafale Cs lost. 1 Rafale C fires 2 WVR missiles. 0 Su-30s lost. 67 Su-30s engage 1 Rafale C in gun fight. 1 Su-30 and 1 Rafale C lost. 66 Su-30s remaining. Red Force victory. 76 Su-30s engage 58 Rafale Cs. 58 Rafale Cs fire 116 3-missile BVR salvos. 31 Su-30s lost. 45 Su-30s fire 90 3-missile BVR salvos. 24 Rafale Cs lost. 34 Rafale Cs fire 68 WVR missiles. 10 Su-30s lost. 35 Su-30s fire 140 WVR missiles. 21 Rafale Cs lost. 35 Su-30s engage 13 Rafale Cs in gun fight. 13 Su-30s and 13 Rafale Cs lost. 22 Su-30s remaining. Red Force victory. 76 Su-30s engage 44 Typhoons. 76 Su-30s fire 152 3-missile BVR salvos. 41 Typhoon lost. 3 Typhoons fire 6 3-missile BVR salvos. 2 Su-30s lost. 74 Su-30s fire 296 WVR missiles. 3 Typhoons lost. 74 Su-30s remaining. Red Force victory. 76 Su-30s engage 245 FLXs. 76 Su-30s fire 152 3-missile BVR salvos. 41 FLXs lost. 204 FLXs fire 204 4-missile salvos. 69 Su-30s lost. 7 Su-30s fire 28 WVR missiles. 4 FLXs lost. 200 FLXs fire 400 WVR missiles. 7 Su-30s lost. 200 FLXs remaining. Blue Force victory. As it can be seen, following things play part in winning an (admittedly straightforward) engagement: number of fighters, number of missiles and a first-shot advantage. Lack of numbers meant that F-22 and F-35 lost despite being given a first shot advantage; similarly, large numerical advantage that FLX force enjoyed over the Su-30 force meant that it achieved almost 1,7:1 exchange ratio advantage despite Su-30 enjoying both first-shot advantage as well as carrying far greater number of missiles per aircraft. In a more realistic situation, FLX will have first-look, first-shot capability against Su-30 thanks to better situational awareness, smaller IR signature and higher cruise speed, which will potentially allow FLX force to wipe out Su-30 force at BVR while suffering few or no losses in return. If some Su-30s do survive, FLXs can use IRIS-T missiles carried to neutralize most, if not all, BVR missiles fired by Su-30s and then close in for IR missile or gun kill. Other than this very specific scenario, it is more likely that standard combat will involve fighters patrolling areas of interest and trying to surprise the opponent. As AWACS aircraft will have been shot down, advantage in surprise will be with the side that manages to use ground radars to detect enemy fighters. Stealth will prove irrelevant in such scenario with proliferation of VHF and HF radars. If ground radars are not avaliable (shut down, destroyed or simply not present), then surprise will be on side of the aircraft that has characteristics discussed in first subsection of this part of the article; as FLX is superior in these characteristics to any presently existing fighters, it can be expected to achieve surprise more often than not. Nature of FLX as a small, supercruising fighter with all-passive avionics will allow it to achieve surprise advantage against any fighter currently existing or planned, while providing almost three times the effective force in the air of Saab Gripen. If produced, it will render all other fighters obsolete. This entry was posted on February 15, 2014 at 7:05 am	and is filed under proposals. Tagged: air superiority, fighter, proposal. You can follow any responses to this entry through the RSS 2.0 feed. You can leave a response, or trackback from your own site. But yeah I agree that this is the right decision, although pilots may find it a bit of an annoyance. Yeah I figured this was the right decision. Other reason is that among the shots that hit the target, the 30mm is more likely to do heavy damage to the target. – I suppose there will be no use of composites? – So the body will be made mostly out of aluminum? Just titanium on the landing gear? Or anything else in the structure? – Regarding the missile, do you think you should have a backup IR sensor, in case the intended target shuts off it’s radar? On the upside, there is less chance of getting trapped inside cockpit a la F-22. Depends on wether aluminium legures can be used to achieve this weight. Landing gear is titanium, and some parts of the airframe might be titanium too if required (titanium is stronger than aluminium). If target does shut off its radar then missile has achieved half the mission. But IR sensor combined with passive receiver may be too heavy; it might be better to simply use a radar that can act in both transmit-and-receive as well as receive-only mode. After all, if target does shut down its radar, chances are that it already suspects it is being attacked. You’re referring to that software malfunction? Yeah there is that. Yeah that’s more because they over-computerized everything. Complexity for the sake of complexity. There are a few other issues it seems not withstanding the Hypoxia with the F-22. The missiles are not reliable at low temperatures. This could have it’s issues when it comes to some environments – especially here in Canada. Both the F-35 and Eurofighter had issues with cold temperatures too, although I’m not sure if the Eurofighter’s issues have been fixed (after all they did go to Alaska). F-35s though for sure have not been. Canards and leading edge flaps too are made of titanium. Eurofighter too. The big problem I see with both designs is the excessive use of composites on the wing and fuselage, which could have an impact on repair and reliability in the field. When I asked no composites, I consider it a good thing that there are few to no composites. The increasing use of composites makes me uncomfortable, especially now that it’s entering the world of civil aviation. With the Airbus A380 and the Boeing 787, we’re seeing progressively more composites being used. One of the more fascinating things about the F-22, off topic, is it’s use of titanium. Close to 40% of the total mass of the F-22 is titanium – and 67% in the rear fuselage. Of course, whether the F-22 is to be emulated is another matter entirely. Then again – it wasn’t really the titanium that led to cost overruns, most likely it was the stealth coating, TVC, and electronics. There is that to consider – AWACs with disabling it you’ve done half the mission. That and the missile may just home into the last known location. How much more mass would that IR sensor add? Somewhat off topic Picard, but have you ever felt at times that you’re the only person that realizes how self-inflicted so many of the problems that our society seems to be facing are? – The fact that this is a paper aircraft at all and nothing like it (closest fighters to it are the YF-16, Gripen, and Rafale) has ever left the drawing boards? – Rise of ultra-expensive, in-effective weapons systems ever since the end of WWII? It seems that all of the hard won lessons have been forgotten. – Magnitude of corruption within the defense departments of many governments around? – A failure to recognize through previous combat and realistic testing how ineffective certain weapons systems (like radar guided missiles are)? – Hell, even the political system? Most of the Western world basically has one political party – the neoliberal party and it’s more or less been a total disaster for the past 30 years. Sigh … was just on a forum where a lot of the people believe the hype and seem to really believe that the US has no money for defense and blame the current administration for “defense cuts”. Well, the Obama administration certainly does deserve a lot of blame, but not for cuts, which have left the US defense spending at historical high levels. Part of the reason is because of “racket paradox”. That is to say, a partially efficient solution is more profitable than a perfect solution. For a defense contractor, a partially effective weapons system is more profitable than a simpler effective one. It will drive unit costs (and thus profitability up), more money can be earned from fixing the problems associated with the system, more units may have to be bought because of imperfections, and so on. But another part may be that people just don’t want to well, think. Not really, I came across Sprey’s presentations fairly early on. And all problems you have listed can be traced back to the materialism and capitalism. And that is the main problem. 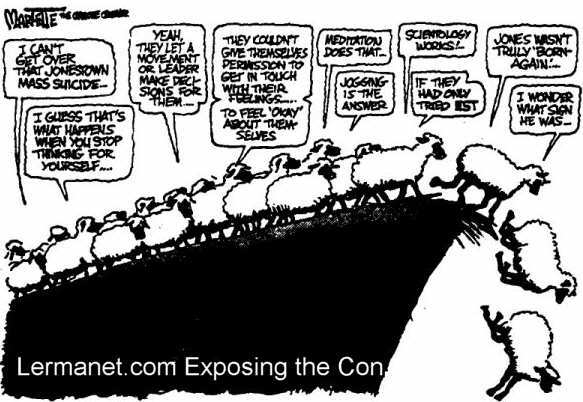 It is far easier to sit back and sponge up BS served by corporations and politicians than to make an effort to separate lies from reality. I like your fighter proposals more and more. I always believed fighters should be as small as possible and found very hard to comprehend the increasing size of modern fighters especially in the light of the fact that supposedly as technology advances subsystems become smaller. The problem with modern fighter designs, is that while most of them boast about how technologically advanced they are most of them are in fact not. Most of them simply cram as much “technology” as allowed by the desired thrust to weight ration without wasting a single synapse on whether that technology is necessary. So we get fighters that are bigger then 50s era bombers. That process is similar in other branches of military spending: MBTs which are supposedly descendent from medium tanks now weigh more then WWII heavy tanks, Frigates weigh more then WWII light cruisers, Hum-vees are 4 times as big as WWII era jeeps and carry the same armament and number of persons. etc. In civilian designs the trend is inverse, things get smaller, a gaming laptop today weighs less and is slimmer then slim laptops of 5 years ago. A 6 inch screen smart-phone is more powerful and offers more entertainment options then an 15inch screen entertainment laptop of 5 years ago, smaller cars are more popular now then ever, even in categories that were usually characterized by big size, such as SUVs, smaller models are more popular take Nissan Juke, VW Tiguan, BMW X1 etc as examples. So what dose this mean? Are civilian engineers better then military ones? My opinion is that they are not, and that the problem lies with demand. In civilian markets, people equate smaller size with greater quality and usability so the demand is for things to get smaller. On the military side the demand is created by cretin generals, which try to overcompensate for some personal lacking and demand bigger designs. There are however exceptions. Three come to mind: Sweden, France and Japan. All three of this countries have had a very healthy respect for science and especially, for good engineering, and also their generals seem to not need to overcompensate for something either because it’s too cold (Sweden), they got used to the fact that small is not necessarily bad centuries ago (Japan) or they simply have no reason to compensate for something (France) 😀 . This three countries have produced interesting designs that use technology to minimize size and decrees cost: Rafale and Gripen are 75% respectively 50% the size of their competitors and manage to achieve higher performance, french LeClerc is the culmination of 50 years of french tank design that has emphasized small sized and correct use of new technology above all else (French medium tank designs in the 50 and 60s were 20-30tons and usually had auto-loaders) and Japan has built in the Type 10 a 40 ton tank with the same protection as a 70 ton Leopard 2 simply by using nano-crystalline alloys (a very hi technology that Japan has mastered over the past 30 years). Your designs, even while you critic the reliance on technology, make use of a lot of high technology but use it the right why to decrease the size of the product. For example your choice of a IRST over a AESA radar. Both are equally high technologies but AESA radar increases the size of the fighter and makes it vulnerable whilst the IRST offers almost the same performance and allows the size to be smaller. Same with the choice of interferometric RWR over radar. Unfortunately except for the Swiss ALR Piranha project in the 80s that I linked in another post, most modern designers seem to be afraid to think out of the box imposed by retarded generals. Even the Gripen is getting bigger. This one is probably the last one, it is finally one design I can’t find any flaws in. Modern fighters are either fighter-bombers or bomber interceptors, both which have historically always been large. There are literally no dedicated air superiority fighters in existence. As military reformers have often stated, problem is not in technology. Problem is in how technology is applied. Actually MBTs are descendants of World War II heavy tanks, more spiecifically Tiger I, which was twice as heavy as Sherman yet almost as fast and arguably more mobile (tactically speaking, strategically it had to change tracks when going by road and out of it, could not cross most bridges, broke down often etc.). Civillian engineers work in conditions where they have to find practical solutions if their firms are to survive, while military suppliers are often protected by the governments. Further, it is easy to know what is good in civillian engineering – just see what sells, after all the goal is to make profit, and people are not going to buy impractical things (most of the time, anyway; but even when they do, they’ll usually abandon them after some time). But military has to prepare for war during times of peace, when it doesn’t have to worry so much about efficiency, and does not have a fist-in-the-eye lessons of what actually works. Combine that with far more lavish budgets allowed, and you can see why it is easy for corporations to milk the military, especially when helped by their agents within the government (lobbysts, politicians etc.). Yes, but LeClerc and possibly Type 10 are impractical simply due to very high costs (LeClerc is quite expensive, and I assume Type 10 also is). I never criticized reliance on technology – you can’t wage war without it, so by definition you have to rely on it to an extent. What I did criticize is misapplication of technology, belief that more bells and whistles automatically make for a better product, and overreliance on technology while ignoring more important factors. War is a dirty business, and you want the simplest designs that are still capable of carrying out the mission. But as always, it is easy to go too far to either extreme; hardest thing is to find the right balance. Take for example the radar: when introduced, it was a very useful technology. But its limitations were discovered fairly quickly; Japanese used first RWRs in World War II on their ships, and combined with better trained crews, it allowed them to successfully engage overwhelmingly superior US naval forces in several night battles. Night battles between US and Japanese forces also show problems of active sensors in general: in one battle, Admiral Tanaka with 8 destroyers engaged US detachment of 5 cruisers and 6 destroyers. Japanese did not have either radar or radar warners; but US fleet made several mistakes, including opening artillery fire before it was clear wether torpedoes hit. Only 4 destroyers engaged US forces – remaining 4 continuing with their delivery of supplies onto designated island – but they managed to sink one and heavily damage 3 US cruisers while loosing only one destroyer; and even that one destroyer could have survived had its captain not disobeyed orders and ordered artillery fire. Now, radar is outdated and dangerous technology, yet everyone still clings to it – it is used on aircraft and ships regardless of their mission, and even on some ground vehicles. It probably will not be superceded by anything for the next 30-40 years. I suspect that any future designs will be incremental more so than anything else. Mostly incremental improvements. We’re probably not going to see any radical developments on par with say, the Me-262. What might happen on the NGF? Well, engine efficiency will again improve and materials sciences may advance. Looking ahead 30-40 years from now, peak oil will of course passed, so it begs the question, will even small fighters be affordable? It could be argued that most modern fighters are descendents of heavy fighters – essentially bomber interceptors. I think it’s the peacetime garrison mentality that causes decay. War by nature forces a certain kind of efficiency on armies and on the nations involved. The reason why you don’t see massive failures like the F-35 in smaller nations like Sweden is I think, their size forces a certain degree of efficiency. That’s why they are efficient in their resource usage. Man for man, a smaller nation’s military will probably be better than that of a larger nation. Against this you have the need for weapons that actually work. I think there has been a unwillingness in the West to recognize what technology can and cannot do. Especially noteworthy in modern air forces is I think what could be called “the limitations of air power”. There isn’t a sense of understanding of what air power simply cannot do. Officially the USAF claims that air power can win wars alone. That simply is not the case, but it’s a powerful guiding force to how the US has waged war. By that time alternatives will (hopefully) have been found. I hope it happens even before that, as oil has far more important uses than burning it. There is literally nothing which can’t be made from oil, and yes it includes food. Exactly. Small nations don’t have money to waste and are so more careful about what they use it on. Problem is that Western militaries, especially US military, have hailed technology as a solution to all problems, and would have a difficult time now admitting that yes, technology does have limitations. Even though it is obvious to anyone above amoeba-level of independent thought. Thinking about this further – only way this could happen is if ramjet technology came out and became viable somehow. Heh… turned out I was wrong. High technology forces, like everything else has its limits. To be honest, I’ve always wondered if it’s cultural. There’s a powerful anti-intellectualism force in the US, even compared to the rest of the Western world. It is cultural, Western culture is materialistic and money-oriented and that shows in military too. We seem to live in a society where a person’s worth is judged not by what they do, but by how much money they have. I’d like to get your opinion on an issue. Do you think there could be an advantage to designing an kinetic-kill WVR – IR missile. That is one without an warhead. As I see it, for WVR missiles I don’t know if proximity warheads offer much. I mean an aircraft targeted by a WVR – missile will maneuver violently to escape, and the chances are that a proximity detonation even with continuous-rod warhead will not damage the aircraft because the aircraft would already be moving away from the blast. What do you know from history how many IR-missile kills have been from impact and how many from proximity detonation. A kinetic kill IR missile could be maybe a quarter of the size of IRIS-T for the same maneuvering performance allowing for more to be carried and maybe salvo fired. Also for increasing precision in the terminal phase it could split into several sub-projectiles like the Starstreak missile ( http://en.wikipedia.org/wiki/Starstreak ) . 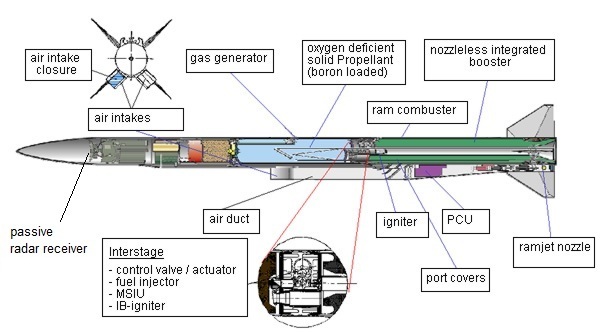 Also it could be turned much more easily into a BVR missile by the procedure you suggested in this article. Probably none. Fighters are too agile for such missiles to work reliably, and any cost reduction is offset by reduction in Pk. No data on that, but I do know that contact-fuzed SAMs had significantly lower Pk than proximity-fuzed ones (0,0-some % vs 0,1-1%). Pk would not be very good for such a missile at the edge of WVR-ranges. Kinetic weapons are only going to be good for slow moving targets or preferably, stationary targets like buildings. They make sense for tanks because tanks will move at 100 km/h tops (and usually much less than that). Fighters remember are moving at close to the soundbarrier or supercruising in enemy airspace. Plus aircraft have the freedom to move in all 3 dimensions. At gun ranges though, it changes and I could see a kinetic kill weapon having some utility. The question is, why use it in place of a gun? The missile will weigh more than gun ammo and it will struggle to maneuver towards the target in gun ranges. Rethinking this, it might work potentially as a bomber interceptor at close ranges (higher Pk than a gun would), but that’s about all I can think of for it. I was thinking for it more as a weapon for the Next Generation fighter you were talking about, somewhere above. Presumably this Next Generation Fighter would come into exist 40 years from now, when Directed Energy Weapons would be mature technology and would, maybe, replace the gun. In this scenario I would see that instead of being retired the gun would become a kinetic kill missile (KKM) launcher instead. I don’t see KKM being fired in ones like today’s IR – missiles, but in salvos of at least two. Launchers would permit KKM missiles to have an initial speed of the fighters speed plus whatever it’s muzzle velocity, and would permit KKM to be significantly smaller, thus being carried in larger numbers. With two launchers and a capacity to burst fire two KKM in 0.5 s the fighters could be going around firing salvos of 4 KKMs which would significantly improve Pk’s at ranges between 2km and 10 km. Well because in about 40 years with improvement in IRST, WVR combat might start at ranges at which we now consider it to be BVR combat. In this situation dogfights might happen at ranges above current gun ranges. Would it be practical seeing that this aircraft is going to spend a substantial amount of its lifespan at supersonic speeds, to design the airframe to “ride” the compression waves? I’m not sure how to do that, I mostly focused on maneuvering performance and wave drag (yet another reason for a single-engined design, btw). Re-thinking it, I may take that back. For the aircraft to “ride” supersonic booms, it would have to be either wing anhedral with dihedral canards. The interesting thing about this is that you could hypothetically have your aircraft remain stable for your wing sweep divided by about 5. That was discovered by a German scientist, Dietrich Kuchemann. So you’re looking at 8-9 degrees maximum anhedral. The optimum amount would need wind tunnel testing though. The only other option to waveride well would be to have the wingtips form a wedge under the aircraft. Look up what the XB-70 did. Yeah maybe that isn’t viable. Oh well, it was worth looking at. Yeah I probably take that back. What I had in mind was known as a “waverider”, which is an aircraft that attempts to “ride” its own supersonic shockwave that was generated by that aircraft exceeding the sound barrier. This requires a sharply pointed nose followed by a concave underneath, hence the downward pointed wings. This is known as a caret wing. Anyways, with wing anhedral, you would also need the aircraft’s wing tips to sweep downward as occurred in the XB-70 (actually you may not even need the anhedral wings in that case … hmm gotta thing about this more; simple waveriders only work at certain machs which is why you need the wingtips to sweep downwards). The goal of this is to create a concave shape underneath the aircraft. This concave shape in turn allows the aircraft to “ride” on the shockwave produced by it’s own sonic boom when it exceeds the soundbarrier, generating what is called “compression lift”. That is like any lift – improving the aircraft’s lift to drag ratio, but generated from the sonic boom. The reason why I thought the design might work is because of the large wing and the fact that the aircraft spends a large proportion of it’s time supersonic. 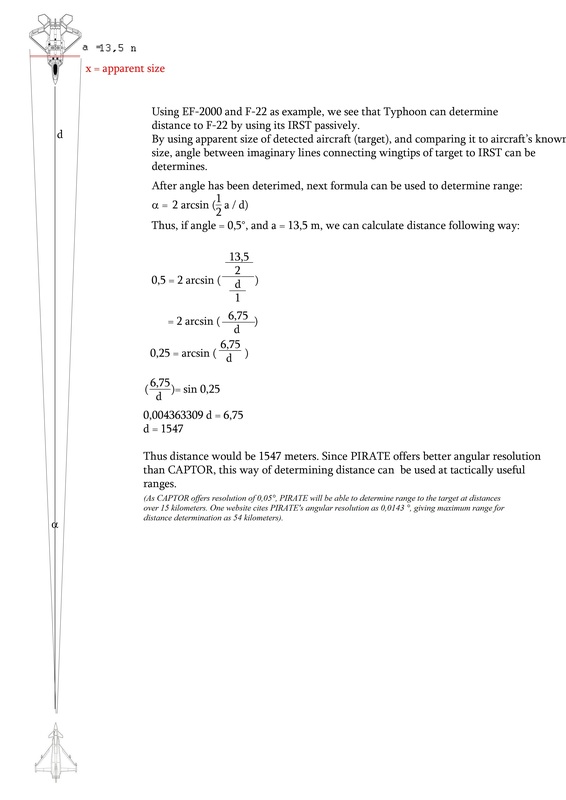 I’m not sure how big the shockwave would be generated at mach 1.6 though – perhaps it’s not that much. I’m looking for the original source (link got deleted on Nasa’s website for the more detailed write-up). Unless something revolutionary happens, it’s probably what’s to be expected. Revolutionary would be say, a technology that completely eliminated the sonic boom and with it, the associated wave drag. I did not notice the area rule measure in your drawing, this airframe may not be able to break the sound barrier. – Do you think that a wingtip device could be put on the wing tips? You might see a ~3% gain in fuel efficiency if you did. – Is it necessary to make an S shaped inlet for the radar? As in, does performance suffer than from a straight inlet? I suppose the issues here are the radar section and the thermal signature of the engine. This is a picture of the B-36. Apparently its size and complexity meant at the time that only a few airfields could service it. Tracks were abandoned because of their noise and because the friction they generated could cause a fire. I think that with a low enough takeoff speed, the friction could be mitigated. Smaller aircraft, but worth a look at. The big issue I see is extra weight. 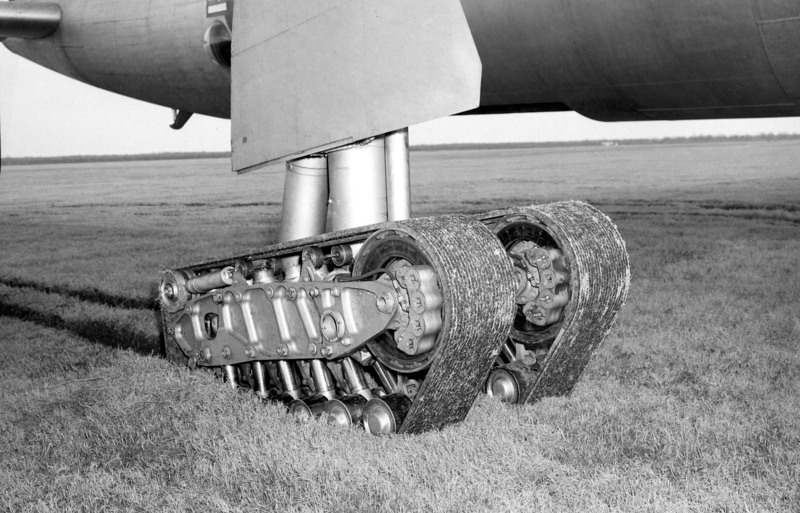 The tracks weigh quite a bit and that is weight that cannot be shed on takeoff. Are you actually saying that any BVR missile will have the same Pk against any plane, without any variation? There are always variations, values I have cited are only average values used to estimate number of on-board kills. I didn’t think one has to be a genius to work that out. When you are basing your strategy on a “scenario” where everyone comes in clearly defined masses without any influence of intel, supporting assets, various specific capabilities of each aircraft, training, anyone has the right to point at you and laugh. It’s the old joke of a physicist giving advice to a farmer using a model of a “spherical cow in a frictionless vacuum”. Since when is a “not very likely”, “highly specific scenario” a measure of standard air combat? But no matter what the scenario is, having more fighters in the air is always an advantage. That being said, scenario as used is very relevant for a) defense of the Taiwan, b) defense of the any other island and c) defense of the carrier battle group, even though situation is still likely to be far more complex than described.